Back in the mid-1980s, before the world discovered its raving feet, Ibiza and its DJs like Alfredo pushed a musical belief that eventually became known as Balearic Beat. The only rule of Balearic Beat, was that there was no rules: so long as it moved you anything went in a DJ set. For an artist like Chile’s Luciano, who has been a DJ on the island for many years, that spirit of openness comes as second nature. Luciano first landed in Ibiza to visit his friend Ricardo Villalobos. So blown away was he, by the island’s unique culture and parties, that he decided to stay. Before long, he was DJing at small underground events. His first official gig was with Cocoon. Then he landed a regular slot at Ibiza’s notorious afterhours club, Circoloco at DC10, where he remained a resident DJ for six years. During his time at DC10, Luciano became famous for his magical, mind-altering sets that combined warm-blooded Latino rhythms, futuristic techno and rough house grooves. In 2009, when DC10 was shut for the summer, Luciano was determined to bring back the underground spirit to Ibiza by hosting a free outdoor party at a little known beach bar called Ushuaia. From a one-off event, it exploded into the biggest party of the summer, and such was the success of Luciano’s parties, that they helped lead to the launch of Ibiza’s glitzy new Ushuaia hotel-club complex in 2011. Ushuaia is now Ibiza’s most famous outdoor venue, and Luciano has been a resident DJ since it opened. Following the success of Luciano’s Ushuaia parties in 2009, all of Ibiza’s clubs were clamouring for Luciano to play for them. In the end, he chose Pacha as the perfect destination to express his musical vision and in the summer of 2010 he launched his Vagabundos concept at the opulent club. The parties were a runaway success, with Luciano and his fellow Cadenza artists playing to a packed Pacha every Sunday night throughout the summers. Vagabundos is now a world-recognised club brand, celebrated for its wild and stylish carnival affairs that are powered by the very best DJs in house and techno. 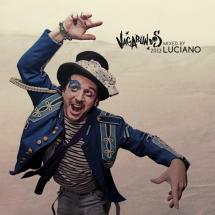 You can feel that history, and a lot of Ibiza’s spirit, on Luciano’s Vagabundos 2012 compilation CD. With wide-reaching influences and diverse musical citations from across the dance music spectrum, Vagabundos 2012 carries the essence of the original Balearic Beat. It is perhaps the modern sound of Ibiza. With moments of intense darkness and life-affirming sunshine rhythms, the mix Luciano creates is like a sublime painting of the island which contains all the colours and gradations of the rainbow. From house to techno, to human and machine created rhythms, sweet voices and warped vocals, blissful beach melodies and mind-twisting notes, classic Chicago beats and futuristic grooves, the mix is a deeply absorbing, multi-dimensional electronic fusion. There is so much wonderful density in this small 76 minute package, that it seems almost counter-intuitive to dissect it. Perhaps one of the main reasons for Vagabundos 2012’s apparent depth is Luciano’s increasing love for molecular mixing. Luciano uses digital DJing technology to deconstruct tracks and re-construct them into any shape he chooses, allowing him to mix parts from up to four different tracks at once. Playing this way, Luciano is able to blend loops, basslines, vocals, hi hats, and melodies together in ways that vinyl or CDs could never allow him to do. It is one of the reasons why Vagabundos 2012 is such a fluid, evolving, and engrossing journey, full of unexpected twists and turns. Yes, on the face of it, Vagabundos 2012 is still just a DJ set, but it feels much more like a living electronic soundtrack, an unpredictable beast, unshackled and full of energy. Beginning with a delicate and magical introduction from Le K, Luciano immediately brings us into another world, full of light and love. The mix subtly evolves into a dubby techno loop from Substance & Vainqueur, which Luciano tinkers into a bubbly bass monster by working in Technasia’s forthcoming Cadenza track Michigan Ride. Nick Harris then joins the party, adding some gentle synth pulses and wild percussion, giving the mix a sleazy, late night feel. All of this happens before the sixth minute mark. The high-octane changeovers and the mixes’ fast growing vines of rhythm continue to spurt forth at a breathtaking pace. Alex Gori, BBQ, Pompeya, DJ Wild – Luciano works in parts from all of those tracks before the 20 minute point, taking us from techno to house to deep house to percussive house and back to techno again. Nick Harris’ Surfing With Kilgore pops up for a third time in the mix with DJ Wild’s Catania Blues, not that you’d ever recognise it such is the deftness and subtlety of Luciano’s hands. As the mix ebbs and flows through pulsating techno rhythms, cool vocals and dirty house drops from Dave Aju, Rhadow, Dani Casarano, El Pocho, and Zakes Bantwini, it’s impossible to keep track of what the hell Luciano is doing. It is techno, is it house, is it the sound of a circus? When the stunning AM Mix of Guy J’s ‘Lamur’ hits around 53 minutes, it’s futuristic Goa trance and tribal madness all at once. It’s one of the CD’s more beautiful moments. Rounding off his mix, Luciano works in one of his old Lucien-N-Luciano melodic downtempo classics ‘Somewhere We Got’, providing the mix with a stunning and dreamy end-of-the-night conclusion. In the end, try as we might, it’s impossible to categorise the Vagabundos 2012 mix as it sounds so uniquely Luciano. It is Luciano. But at a push, we’d like to say it is also the sound of Balearic Beat in 2012.